The Best Turkey Bacon We've Ever Eaten!, originally uploaded by allen texas. 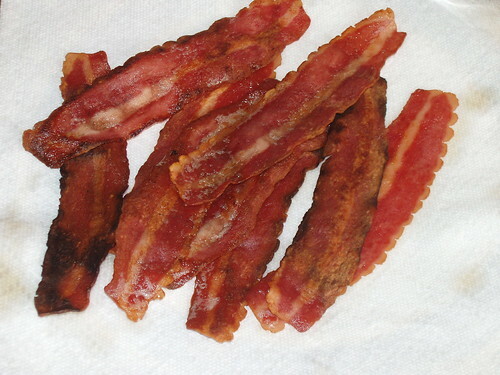 I watched a vegetarian cook bacon at my house this weekend, and I think that is pretty funny. Why, you ask, did I make her cook the bacon? Simple. Because I burned almost an entire package trying. Apparently low to medium heat is a temperature concept I don't grasp very well. I've never cooked bacon before. So thank you, Kylene, for teaching me how to cook bacon, although you will not eat it yourself. You are a good friend. I can't stop laughing!!! HA HA!! wow...I can't believe you talked Ky into cooking bacon. That has never happened before. Now, we know she CAN DO IT!! Justin, did you hear this?? Hi Kylene's Mom!!! She looked like a pro--you would've definitely been proud. I have to wonder...how did 3 girls make it to our ages without ever having cooked bacon?!? Because we had great parents to cook bacon for us! HA HA! I LOVE turkey bacon! YUM!